The first thing to do was to get the data. The general manager had filed away a couple of years of Dominion Virginia Power’s monthly bills, so I got copies and started entering them into a spreadsheet. Turns out the entire complex has only three monthly bills: one for “the pool area”, one for the two residential towers on the one side of the street (11 stories each, with three below-ground garage levels), and one for the two residential towers on the other side of the street (10 stories each, with two below-ground garage levels). So we won’t be able to dig too deeply, but it is what we have. As in any real-world analysis, there was a lot of messy variability. First, the billing “months” vary from 28 days to 34 days, depending on when the meter reader comes by. Second, Dominion is regulated and that means they engage in an elaborate dance with the State Corporation Commission (SCC). For example, Dominion is allowed to raise rates on a provisional basis, and the SCC can later decide that the increase was not justified, forcing Dominion to issue refunds. It turns out that it’s very hard to credit refunds back to their originating months, so I chose to work with the average daily usage (monthly usage divided by the length of the billing period), and the average daily expenditures ignoring refunds. I started recording just these few values into a spreadsheet, but as time went on other questions came up, and in the end I decided to go back and record every number on the bill: days, surcharges, fees, taxes, refunds, all of it. Each line of the spreadsheet totaled it all up so I could double-check against the bill total when I was done, to catch typos. I also found that the Dominion allowed you to establish an account online that would let you download PDFs of your bills, and that the Association had not set this up, so I worked with them to set it up, making the ongoing process much easier. (Also avoiding things like trying to guess a number that had a “PAID” stamp over it and was then photocopied.) The online data only goes back 18 months, though, so paper records were important. Most of us consumers are not familiar with “demand billing” because we’re only billed for usage. Demand is applicable to commercial customers and is a measure of the maximum amount of power they use in any 15-minute period during the month. That is, there’s an important difference between continuously using 150 watts for a month (roughly 720 hours) and using the equivalent 108,000 watts for one hour. Since Dominion has to build enough power-generating capacity to handle peaks and commercial customers can generate huge peaks, they’re allowed to bill commercial customers for their peak demand. As a final step in the initial data gathering, we need to think of exogenous data. For usage, it makes sense that the temperature would have an effect and also the daylight. I got temperature data from NOAA, for Ronald Reagan airport (DCA), which is about four miles from the condos, though at a lower altitude and by a river. 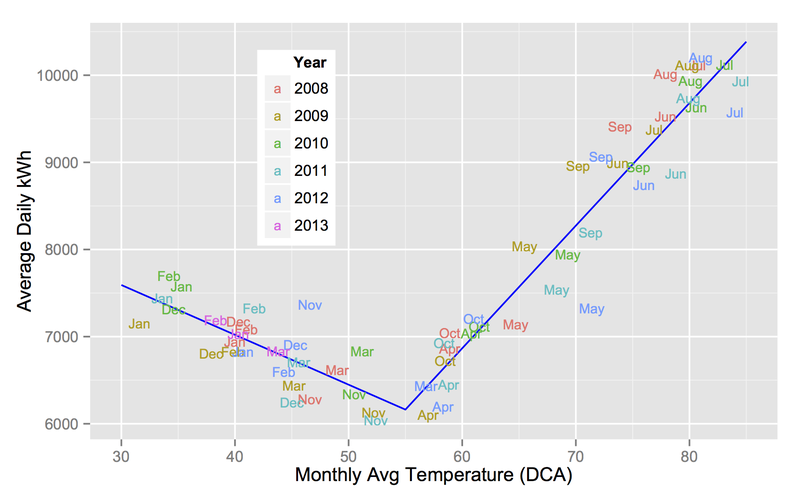 where daily is the daily average usage (bill usage divided by number of days in the bill), dca is the month’s average temperature at DCA, and temp is an indicator that indicates if the dca is cooler or warmer than 54 degrees. This is essentially a piecewise linear regression which pools across the two pieces. The season-independent baseline usage (at ~54 degrees) is roughly 6090 kWh per day: in cooler weather it increases roughly 66 kWh per degree cooler, and in warmer weather it increases roughly 137 kWh per degree warmer. The baseline would include the (indoor) lighting, various pumps, air circulation, elevators, etc, that run year-round regardless of weather. The MAPE of the in-sample forecast is 3.6%. In the next part of the series, we’ll look at modeling and forecasting expenditures with a more complicated fixed-effects model.